A few weeks ago, HP announced that consumers should see another wave of $99/$149 TouchPads to be available by sometime October at the earliest. 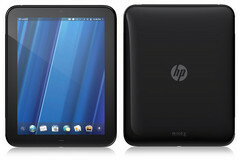 For HP employees, however, they may even be given the chance to order one before everyone else can. According to an internal memo leaked by TechCrunch, the next set of 16GB and 32GB TouchPads will be ready by September 28th for only HP employees on a first come, first serve basis. Of course, each employee would be allowed one tablet per order maximum and could take up to 10 days to ship to assure availability for as many interested employees as possible. Exactly when the tablets will be made available to consumer hands was not mentioned, but we imagine that most if not all remaining stock should soon be released to the public soon afterwards. Due to overproduction and slow sales, HP decided to axe the TouchPad hardware in August, but the extremely reduced prices that followed didn't stop consumers from picking up the tablet anyway. In fact, recent advancements on the unofficial Android Gingerbread port has the potential to make the webOS device even more desirable. Those interested in the tablet should keep an eye open for availability starting early next month.